Pork taco with its best friend Gochujang. I’ve made no secret of that fact that, as a cuisine, Asian food is my favorite. It’s what I crave most often, and really the only thing I’m interested in cooking at home when it’s (very rarely) my turn to cook. It’s also a well-known fact that, as a food-delivery system, it’s pretty hard to beat the taco. And when you put the two together, you really get something special. Enter the Korean tacos at Giwa. While I would recommend you also go there for the bibim bap, picking up an order of tacos ($3.65 each or two for $7.25) should always be an option. You can choose either spicy pork or spicy chicken, and they come topped with rice, lettuce, onion, lime juice, cheddar cheese, sour cream, and a healthy side of the restaurant’s very own gochujang sauce (which you can also buy in bottles – do so). The tacos are a pretty serious size—definitely not the tiny palm-of-your-hand street food tacos that are around a lot these days—and they come wrapped in foil so you don’t dump any of the fillings. And speaking of the fillings, you may not normally associate sour cream and cheddar cheese with Korean food, but boy do they go together well. There’s nothing like the spicy gochujang and creamy sour cream mixing together with the slight tang from the lime juice. While I admittedly do not have extensive experience with Philadelphia’s tacos, I think I’ve found everything I need right here. 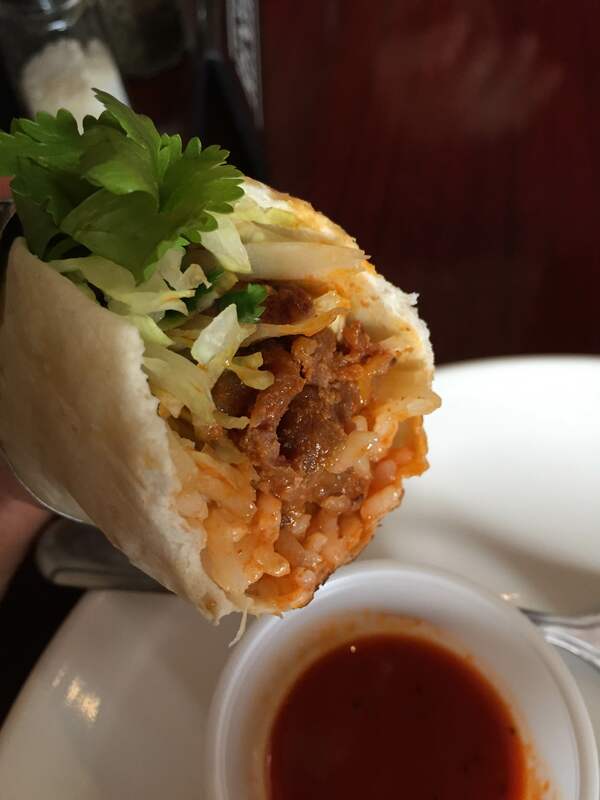 This entry was posted on May 27, 2015 by Ryan in Asian food, PHL Favorite and tagged giwa, gochujang, korean, taco.